Life should be full of colour and fun - spread some joy with Nestlé® Smarties® Mini boxes. Yummy Mini milk chocolate sweets covered in colourful crisp sugar shells. These convenient Smarties® Mini boxes make a great no mess treat for all the family at home or out and about. 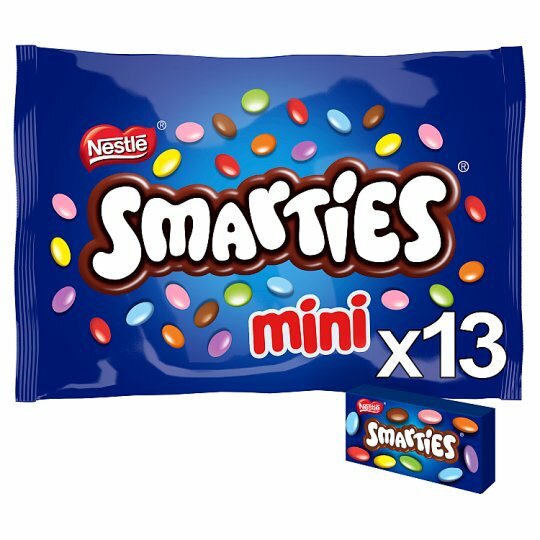 Each box contains everyone's favourite colour fun size Smarties®. Enjoy Smarties® as part of a varied, balanced diet and a healthy lifestyle. Each Mini box contains one individual portion. There are even more ways to share the Smarties® fun: Smarties® Sharing Block is a chocolate extravaganza everyone will love - yummy smooth milk chocolate Smarties® covered in more yummy milk chocolate!